One of the most legendary rock bands on this planet is definitely Guns N’ Roses. 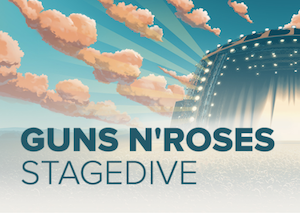 Welcome to the Jungle, Paradise City and November Rain are just some of their greatest hits – and how would you feel about seeing Guns N’ Roses perform live in a big city this summer? Not too bad, huh? Right now you can compete about two VIP tickets to Guns N’ Roses concert in Stockholm in Sweden in June 2017. Over the next nine days you will be able to join the promotion and see if you’re a true InstaCasino rock star. If you’re in it to win it you will have to play some heavy rock n’ roll in the video slot Guns N’ Roses over the next days and complete five different missions. Maybe you’ll end up the winner of these epic tickets! Until midnight today, the 23rd of May, you will be able to grab some extra points before the next mission. Simply log in at InstaCasino today and play Guns N’ Roses video slot for real money – every time you win 20x your own bet on a spin you will receive 250 points to the top list. Between the 24th and 25th of May you will receive 50 points every time you win at least £10 on a single spin. So keep them wheels spinning! The third mission is a casino race which will take place at InstaCasino between the 26th and 27th of May. Just log in and play Guns N’ Roses on desktop. For every £1 you wager on the slot during the race you will claim 1 more point to the competition. The player who wagers the most will get an extra 500 points while the players on 2nd and 3rd place will get 200 additional points. From the 28th to the 29th of May you will get 250 points each time you win at least £50 on a single spin on Guns N’ Roses at InstaCasino. Last but not least you will also be able to join a mobile casino race between the 30th and 31st of May. Once again you will get 1 point for every £1 you wager on Guns N’ Roses on your mobile or tablet. This time the three players that wagers the most will get additional points as well. If you’re not a member at InstaCasino yet it’s not a bad thing because if you sign up now and also makes your first deposit you will receive extra points to the competition. By making your first deposit before the 31st of May you will get 200 points – however if you want more you should make sure that you use the promo code INSTA1 on your first deposit. Then you will get 100% extra up to £200 as a bonus together with an additional 500 points! InstaCasino will give away two VIP tickets to the “Not in this Lifetime” concert with Guns N’ Roses in Stockholm on the 29th of June this summer together with a gift package, flight, transfer, two nights at a luxury hotel and access to a VIP host from InstaCasino too.